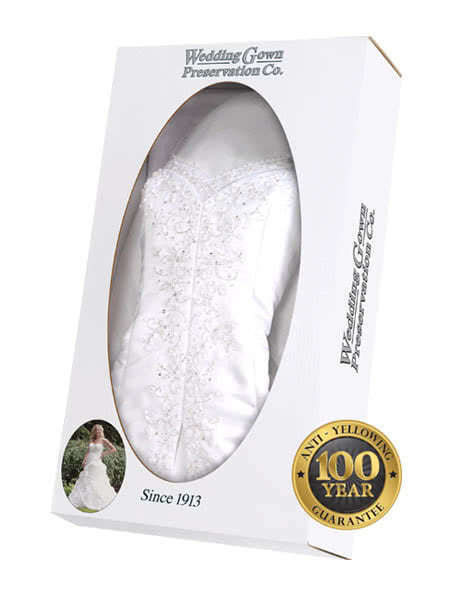 After your wedding gown is carefully inspected, cleaned, repaired, and placed in the preservation chest, it is ready to be placed in our crush-proof, double walled, water-resistant shipping container and safely shipped back to your home for you, your family, and future generations to enjoy. When your finished gown is ready to be shipped back to your home you will receive an e-mail to the account you ordered with. This e-mail will contain all tracking information so you can keep updated on the location of your dress as it makes the short journey back to your home. At any time during your preservation you can use our GownTracker system to check the current stage of the preservation process your gown is in. When your gown arrives we encourage you to give your preserved wedding gown a light inspection. Provided with your final preservation are white gloves to use during your inspection which prevent any oils on your hands from transferring to the delicate cleaned and preserved fabrics of your wedding gown. Also included are sealing squares so that you can re-seal the preservation chest after the light inspection. You may open the kit, pick up the preformed bust to examine train and accessories, inspect your accessories, and examine the hemline of your gown where the most staining and wear occur on your wedding day. Store your gown in a cool, dry area – never in an attic or basement. We recommend only storing your gown in an environment that you yourself would be comfortable in. Remember that your wedding gown is comprised of some of the most delicate fabrics in the textile world and should be treated with love and care during storage. Is a signature required upon delivery of my gown to my home? Yes. While we do require a signature (this is your cherished wedding dress after all!) you can call FedEx and arrange for them to hold your gown at their facility for you to pick up if you are not able to be at your home during the day of delivery. FedEx will normally attempt to deliver up to three times before they hold your shipment at their facility. You also will have the option to schedule your delivery from FedEx at the time of shipment. Can I have my finished gown shipped to a PO Box? No. Due to the size and nature of the wedding gown preservation kit, we cannot ship to PO Boxes or APO's. My gown became damaged due to flood/smoke/mold, etc. while in storage. Can I have it re-preserved? Yes. We've re-preserved gowns that have been damaged in all of the above situations and other natural disasters. Please call ahead with full information of the damage that occurred to your preserved gown. Do You Have Additional Questions Before You Order?